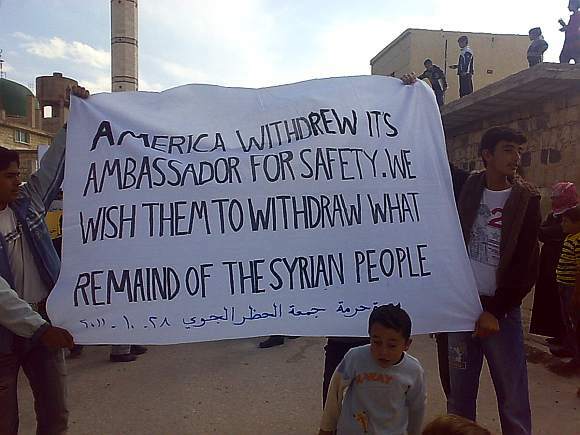 Rediff.com » News » Why is India silent on US military strike against Syria? Why is India silent on US military strike against Syria? Has New Delhi internalised the truth that it does not matter, asks Saeed Naqvi. Such deafening silence from the government, principal opposition, even the pundits! If the sound of war drums over West Asia is receding, it is because the people have spoken. British parliamentary democracy looked more credible than it ever looked during the Blair years: 30 Tory members of parliament voted against their own party. Russia, China, Iran, Germany and others who matter applied the brakes. Has India internalised the truth that it does not matter? Such deafening silence from the government, principal opposition, even the pundits. We are wise people and will read our script after the outcome is known, perhaps after Washington’s token strike to keep the Saudi intelligence chief and hyper diplomat Prince Bandar bin Sultan in good humour. Leave aside former United States president Ronald Reagan’s bombardment of Libya in 1987 when US intelligence overheard incriminating conversation in a Berlin discotheque, all other West-led attacks on Arab or Muslim societies have taken place after the countervailing power of the Soviet Union dissolved in 1990. Beginning with Operation Desert Storm in 1991, there have been a dozen or so military interventions and, in recent years, drone sorties on Muslim countries by the US and former colonial powers, Britain and France. Iraq, Sudan, Afghanistan, Libya, Mali, Yemen, Somalia, Pakistan have been in the line of fire, sometimes repeatedly. Western powers have helped regional powers create conditions for a brutal civil war in Syria. Screws have been tightened on Iran by a series of punitive sanctions. Washington is playing both sides of the street in Egypt. Does this concerted closing in on Muslim societies not make Samuel Huntington, author of The Clash of Civilizations, the original prophet of our times? Are you surprised that in this hothouse atmosphere there is a thing called Muslim anger? If this anger expresses itself in intemperate ways (how can you be angry and temperate), it is liable to be called “terrorism”. A global war on terror is then launched of which we must become a part. How do we explain to the Indian people what we are up to, particularly to the 180 million Muslims who experience the war on terror somewhat differently? Let me try to shed some light on the complexity. A sample of Urdu newspapers in the capital confirms a pronounced reality not commonly noticed: Muslims take a relatively greater interest in foreign affairs. Mahatma Gandhi recognised this fact but adopted a faulty policy on the Khilafat movement. The front page of the Indian Express on the day I am writing this column does not carry a single foreign story. This on a day when Syria and Egypt are obvious stories. By contrast, Qaumi Salamati, a recently launched Urdu newspaper, carries four detailed page one stories on foreign affairs, centred around Western machinations in West Asia. As tributaries to our composite culture, religious, literary, linguistic and other cultural links with the Arab world, Iran and Central Asia are straight forward. Sometimes these linkages are exotic. Who would have expected the 2010 Uzbek-Kyrgyz riots in the Osh in the Farghana valley to find resonance in Delhi’s oldest habitation --Mehrauli? What dominates Mehrauli is the shrine of Sufi Saint Khwaja Bakhtiar Kaki who travelled to India from Osh. Ideally, foreign policy should represent national consensus. The policy of non-alignment forged by former Prime Minister Jawaharlal Nehru in 1947 was therefore a comfortable fit with the Indian social reality. True, Pakistan, Iran, Turkey, Saudi Arabia, and other Arab monarchies were in the Western camp throughout the cold war. Jap raha hai aaj maala ek Hindu ki Arab. Barhaman-zaadey mein shaan-e-dilbari aisi to ho! (The Arab world is chanting the name of a Hindu! Hikmat-e-Pandit Jawahar Lal Nehru ki Qasam! Mar mitey Islam jispe, kaafiri aisi to ho! (Consider the vision of Pandit Nehru! The collapse of the Soviet Union consigned non-alignment to oblivion. To make up for lost times, New Delhi lurched towards the United States. In West Asia, Israel became a special friend. Non-aligned countries became “Muslim” countries in our eyes. How could a Muslim country be very different from Pakistan? Hikmate Jawaharlal Nehru be damned. This new stance in world affairs which India had struck, distanced New Delhi from a national consensus if social realities are not to be overlooked. No, Muslims were not holding hostage India’s foreign policy options in a dynamic world. But disappointment did set in among Muslims and the Centre-Left elite when some supposed constants in world affairs lost their salience for policy-makers. The question of Palestine, for instance. Also, the exceptional warmth in relations with the US coincided with the most aggressive phase in former US President George W Bush’s war on terror. This exposed a major contradiction policy-makers had not taken cognisance of. A hundred thousand people demonstrated at the Ram Leela Maidan against Bush during his visit in 2006. The meeting, where the participants were mostly Muslims, was addressed by all political parties except the Bharatiya Janata Party and the Congress. His address to the joint session of Parliament had to be cancelled. Policy-makers were puzzled. Why were Indian Muslims opposed to the Indo-US nuclear deal? They were not. They were hurt by the Congress-led government cozying up to Bush who, in their perception, was engaged in an undeclared crusade against Muslims. It remains a major contradiction in the navigation of foreign policy of a country which has the world’s second largest Muslim population. The contradiction will plague us time and again. Minister for Minority Affairs Rehman Khan casts doubts on the very existence of the Indian Mujahideen. But newspapers announce in banner headlines the arrest of the IM chief by the Intelligence Bureau. Whom should the world believe? It is against this perspective that the clouds of war over Syria should be seen. Just as an initially reluctant Washington was dragged into the war in Libya by Europe, it came pretty close to be dragged into Syria by an unlikely duet -- Saudi Arabia and Israel. As I mentioned at the outset, the attack on Syria, should it happen, will be the umpteenth US-led military action against a Muslim country since the collapse of the Soviet Union. I mention the Soviet Union repeatedly because unprecedented military might in the possession of a nation in decline is a dangerous new global reality. New Delhi’s silence in such situations may be commended by those who place a value on cunning and craft. But cunning and craft towards what end? I like to imagine neither Nehru nor Vajpayee would have remained silent if there was any risk to Damascus, the world’s oldest, continuous habitation and the great civilisation of which it is the capital.